Which is your brass voice? is an interactive installation employing new technology and new media to create a widely accessible and engaging multi-sensory experience for festival audiences. 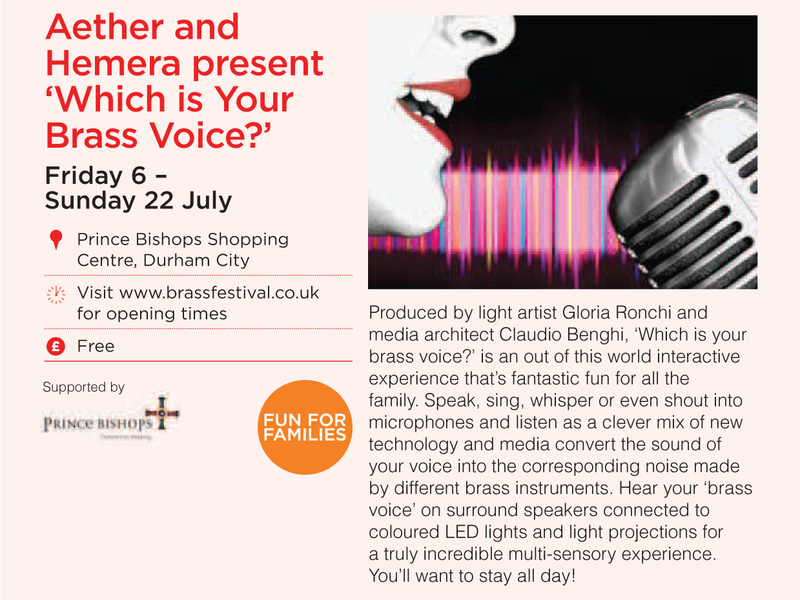 Sited in a busy high street location, the installation invites people to discover their brass voice by speaking, singing, shouting or whispering into microphones set on stands within the space. Capturing the individual nuances of volume, pitch and the intonation of people’s voices, sound is translated in real time to produce the corresponding sounds made by different brass instruments. These brass sounds outputted through surrounding speakers are at the same time synchronised to localized coloured LED lights and light projections within the space to create a fully immersive experience for visitors.